Police on the scene in King Street, near Aberdeen University. Picture by Kami Thomson. Churchgoers rushed to the aid of two pedestrians who were injured after a car mounted the pavement outside their place of worship yesterday. 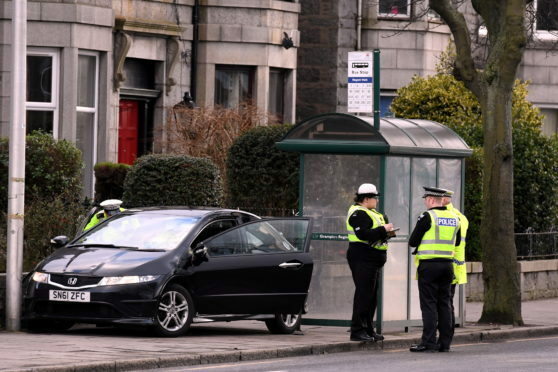 A man and woman, both aged 64, were hit by a black Honda Civic outside St Mary’s Parish Church in Aberdeen just as the Sunday morning service ended and parishioners filed out onto King Street. It is understood that the woman, who suffered serious injuries, is a member of the church. The 70-year-old driver of the car was uninjured, but his vehicle was left with damage to its windshield and fender after coming to rest against a lamppost. Reverend Elsie Fortune praised the response of her flock, who alerted the emergency services and offered to drive home bystanders who were left “shaken” by the alarming incident. She reserved special praise for one St Mary’s elder, who works as a nurse and tended to the wounded pair while waiting for paramedics to arrive. Rev Fortune added: “I know one of our members called the ambulance service and an elder who is a nurse helped out. “Several of our parishioners rallied around and drove home some folk who got a bit of a shock by it all, as they were waiting at the bus stop beside where it happened. The black Honda Civic is understood to have been heading north when the incident occurred, at 12.15pm. The injured pair were taken to Aberdeen Royal Infirmary by ambulance to be treated. A police spokesman confirmed that both suffered “pelvic or lower limb injuries”. One neighbour described the chaotic scenes which unfolded as several ambulances and more than a dozen police officers arrived on the scene. A stretch of King Street was closed for about four hours to allow investigations to take place. Sergeant Colin Matheson, of the city’s road policing department, asked for witnesses to get in touch by calling 101.